Of all of the different types of motorsports racing events that I get to cover as a professional assignment and stock photographer, motorcycle road racing has got to be my favorite. For starters I am a motorcyclist. I have been in the saddle for more than 40 years and have probably logged a quarter million miles in my lifetime. It really helps to have a great feeling for, and understanding of, the subjects you are photographing. It also gives me a "leg up" on some other racing photographers. With a deep understanding of the dynamics of riding a motorcycle I may have a bit of an edge when it comes to anticipating those defining moments in any speed contest. The picture here is a perfect example. Watching these two accomplished riders lean into the turn together is poetry in motion to me. Perfect execution of the high speed turn just inches from each other is an amazing sight to see. It is also a difficult one to capture with a camera. The vehicles are moving at a high rate of speed through your field of vision. You are working with a long telephoto lens to zoom in close on your subjects while recording the largest, highest quality image possible. The choices you make as a photographer in order to consistently capture images of this calibre are many. You must pre-visualize what you want your picture to look like long before you ever bring the camera up to your eyes. You must choose the proper location trackside in order to capture your subjects in the background you wish to show them in. You must pick the appropriate focal length lens to not only reach out to your subjects, but also to compress the scene accentuating the close contact of the racers to each other. You must choose an appropriate shutter speed on your camera to either freeze the action or effect a motion blur to accentuate the speed of these road racing motorcycles. You must choose the appropriate aperture on you camera’s lens to create the exact amount of your image that you wish to appear in focus. Notice how these tack sharp motorcycles stand out against the out of focus wall of safety barrier tires beyond them. 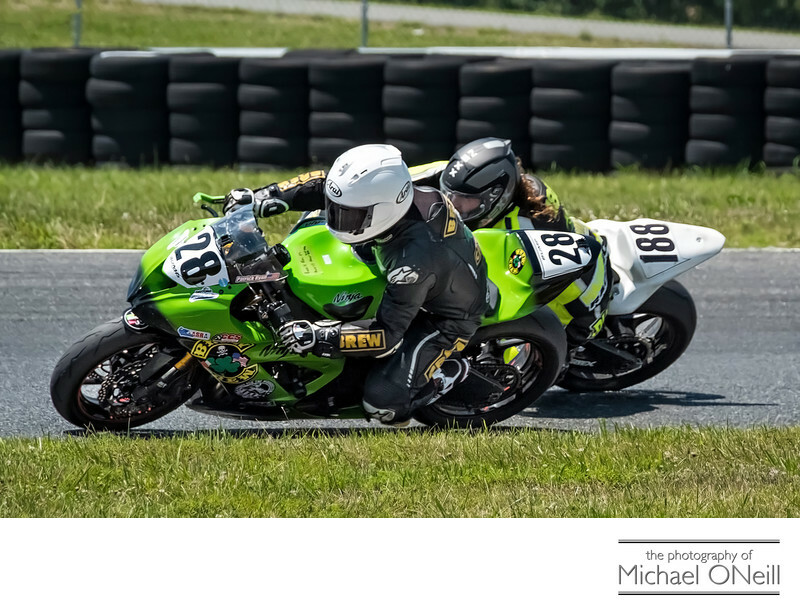 This image was captured on the legendary Thunderbolt road race course at New Jersey Motorsports Park (NJMP) during a recent Championship Cup Series (CCS) event. I’ll be returning to NJMP soon for another CCS event as well as the MotoAmerica series event that will be held there this year.